SINGAPORE - The up-and-coming Jurong Lake District will welcome a new 7ha integrated tourism development from 2026. The Singapore Tourism Board (STB) will be calling for an expression of interest exercise for the development, which will feature a hotel, attractions, eateries and shops, it was announced on Tuesday (April 16). Making the announcement at STB's annual tourism industry conference, Senior Minister of State for Trade and Industry Chee Hong Tat said that with its "unique waterfront environment and location... we envision this area to be transformed into a key attraction from 2026". The 360ha Jurong Lake District is positioned as Singapore's second Central Business District, and previously announced plans for the area include a commercial precinct, housing and expanded gardens. To complement upcoming parks in the Mandai nature precinct, Wildlife Reserves Singapore (WRS) will be refreshing the Singapore Zoo, Night Safari and River Safari, said Mr Chee. WRS said in a statement it has developed a five-year masterplan that “seeks to enhance the distinctiveness of its operating parks... by addressing opportunities for creating immersive exhibits and scaling the delivery of memorable encounters”. The masterplan was formulated last year after a series of workshops and discussions that involved WRS’ management, board, staff and consultants, as well as interviews with members of the public on what they would like to see and experience, it said, adding that more details will be announced in due time. Mr Chee noted that tourism contributes to about 4 per cent of Singapore's gross domestic product and provides opportunities for local companies, with more than 60,000 jobs across its core industries. SDC said in a statement that the scheme, which was launched on Tuesday, will provide businesses with "co-sharing or waiver of venue rental, as well as support in terms of infrastructure and other facilitation resources". STB chief executive Keith Tan said in a speech at the conference that the agency will focus on five areas over the next few years: growing the community of advocates and ambassadors for Singapore; building resilience in its source markets; developing competitive tourism enterprises; harnessing data and technology; and enhancing destination attractiveness. A new mid-sized attraction at the Singapore Flyer called the Time Capsule will open in the last quarter of this year and feature “experiential media”, while a Nerf Family Entertainment Centre will open at Marina Square in October. The expression of interest exercise, launched on Tuesday, has already garnered keen interest, he noted. Apart from the physical tourism landscape, transformation must also take place within the industry, given challenges such as changing traveller behaviour and preferences, more intense competition from other destinations and “more challenges and constraints” domestically, said Mr Tan. In the tourism industry’s bid to become more productive, innovative and digitally savvy, building a steady pipeline of local talent and manpower must be a first priority, he said, adding that Singapore can do better when it comes to employing persons with disabilities. STB will be rolling out several new initiatives to aid industry members in their evolution, including the launch of a Tech College to better prepare tourism businesses for the future, a series of Smart Hotel Transformation workshops to help hotels plan their own technology road maps, and a tourism incubator that will foster new ideas and test solutions. Singapore, which has seen three consecutive years of record highs in tourism arrivals and spending, must not take its success for granted, said Mr Tan. There were 18.5 million international visitor arrivals to Singapore last year. “If what we do does not engage or appeal to Singaporeans, we cannot possibly be a great destination for visitors,” he added. As part of its strategy to draw travellers from China and targeted South-east Asian countries to visit and spend more here, the STB on Tuesday partnered with Alibaba Group and travel booking site Traveloka. Over the next three years, STB and Alibaba will work together on marketing and data sharing efforts, with businesses in the Alibaba ecosystem such as Alipay, Fliggy and Youku helping to provide insights into the travel behaviour of Chinese visitors. Alibaba’s entertainment-related offerings will be leveraged to target young families and professionals, while digital solutions may also be implemented with shops, hotels and attractions here, the two parties said in a statement. Mr Tan said the partnership is a “game changer for Singapore”. “We will for the first time be able to engage with visitors at every step of the consumer journey, from pre-arrival to post-visit, through Alibaba’s platforms and technologies,” he said. STB’s partnership with Traveloka will promote Singapore as a preferred destination to visitors from five major South-east Asian markets: Indonesia, Malaysia, the Philippines, Thailand and Vietnam, which made up a third of visitor arrivals to the Republic last year. More local activities and experiences will be made available for online booking on Traveloka’s regional platforms, while discussions are ongoing to promote Jewel Changi Airport and events such as the Great Singapore Sale in Indonesia, where the travel firm is based. Speaking to reporters about the Jurong Lake tourism development on the sidelines of the conference, Mr Tan said that while it will be integrated with the larger precinct, including the neighbouring Science Centre and gardens, its concept will ultimately depend on the ideas that arise from the express of interest exercise. “So that makes it quite distinctive from some of the other standalone attractions in Singapore,” he said, adding that families with young children would be a natural group to target. Facilities for business events may also be part of plans, as more travellers that mix work with leisure can be expected in line with the surrounding Western Business District. 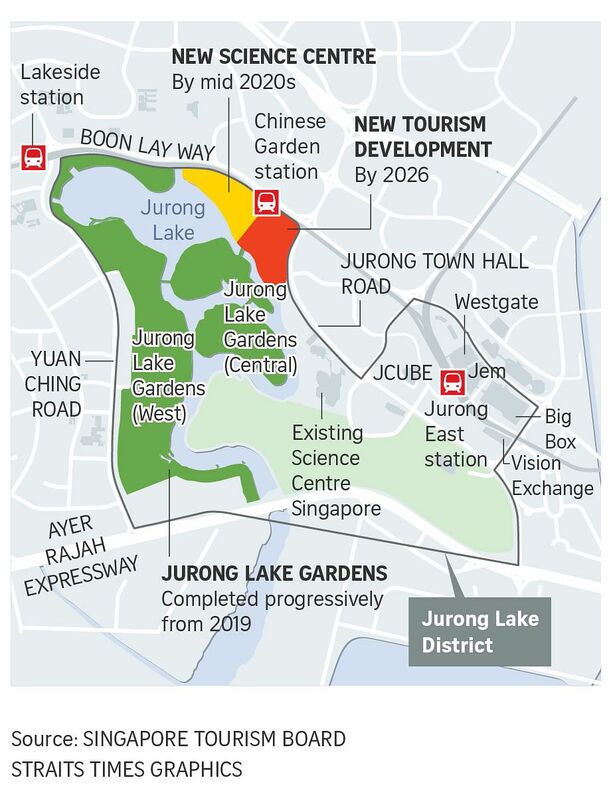 Addressing questions about the location of Singapore's new tourism development, Mr Tan said that the tourism appeal of the Jurong Lake area lies in the space it offers and the promise of the larger precinct. Tourists already make the trek out to further flung attractions such as the Singapore Zoo in Mandai, he noted, adding: “If it is compelling and attractive enough, people will go”. Many Singaporeans may have preconceived notions about the Jurong area, with words like “far away, industrial estate (and) inaccessible” coming to mind, he said. But the Jurong Lake District project aims to change this, with efforts by the Government to bring in more businesses and enhance connectivity with the rest of the island, said Mr Tan. He likened the area to the shopping and entertainment district of Odaiba in Tokyo, which houses several museums and other attractions. “It used to be fort islands, built off Tokyo Bay to protect Tokyo from invasion. So they were just islands built with nothing on them. But today if you go, you can't imagine its origins,” he said, adding that while Jurong already houses attractions, the aim is to reinvent and enhance them. Spreading out Singapore's attractions can also help to increase visitors' average length of stay from 3.4 days currently, said Mr Tan.